As much as I enjoyed all the places we visited while exploring the Yucatan, I think my favorite part of the peninsula were the cenotes. 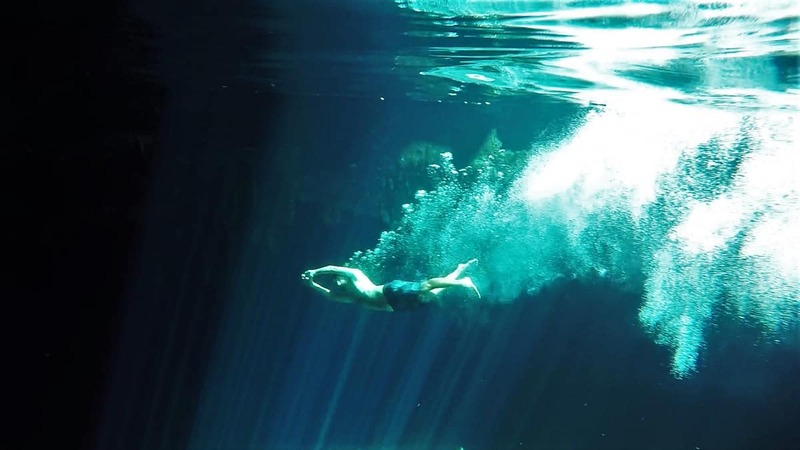 Cenotes, if you are unfamiliar, are underground caverns, caves and swimming holes filled with crystal clear, fresh water. I don’t know the official number, but I would guess there are over 100 cenotes you can visit throughout the peninsula. The best part is that they are all unique. Some are ideal for simply viewing, others for swimming, some for snorkeling, and some are best suited for full on scuba dives. The latter is extremely unique. I didn’t do this during this visit, but when I was down in Tulum on vacation a little while back, I got a chance to Scuba Dive in an underground cenote and it was incredible. Just imagine a cavern filled with stalactites and mites and all those eerie rock formations, but completely submerged, and diving through it with only the light of your underwater flashlight. As for this trip, we visited three cenotes, each with its own touch of character. The first one we visited was on the east coast of the peninsula, inland from Playa Del Carmen. We stopped here for a night while we were on our way up to Holbox. As you make that drive through the peninsula, you’re greeted with countless signs for cenotes. Most of these signs are large, official road signs, like the exit signs you would see for any city. Fantasma on the other hand was a little more discrete, with the only sign we saw being a small, hand painted, wooden sign on a tree. The only reason I knew about it was from scanning the iOverlander app and checking out the reviews people had written for various cenotes. Being that it was a little off the beaten path, and without a major sign, we didn’t have to worry much about the large tour busses packed with people bringing the crowds. In fact, we ended up getting there just before sunset and there was only one other Mexican family at the site. It seemed to be a more recently developed cenote, because they had some newer facilities out front, along with a small restaurant that was in decent shape. From the front, you walked past all the facilities and down a trail that lead back into the woods. After navigating through the woods, you came to clearing where they had new bathrooms and showers, along with a little Tequila making operation where they offered tours and tastings. The cenote was down a small path that lead to a little cave entrance about 7 feet in diameter. Once inside, the cave opened into a large room dropping down about 100 feet into the earth. As you descend the four flights of stairs you feel the air get cooler, and you are brought to a platform built about 15 feet over the water. Here you could either jump off into the natural pool or walk down one more flight to the beautiful cavern water. The pool of water was deep, maybe 30 feet at its deepest point, and was about 30 feet wide by about 50 feet long. There were 2 small holes in the ceiling of the cavern that allowed a couple beams of sunlight to shine down and illuminate the space, which created a really cool ambiance. I think this was my favorite of the three for a couple reasons. The cenote itself being deep in the ground and illuminated the way it was awesome. Beyond that, the lack of crowds really does make it that much more enjoyable. We slept in the parking lot that night, and the next morning I had the entire thing to myself for about an hour. Pretty fantastic way to start my day, and hard to top. The second cenote we visited was a completely different experience than our first one. 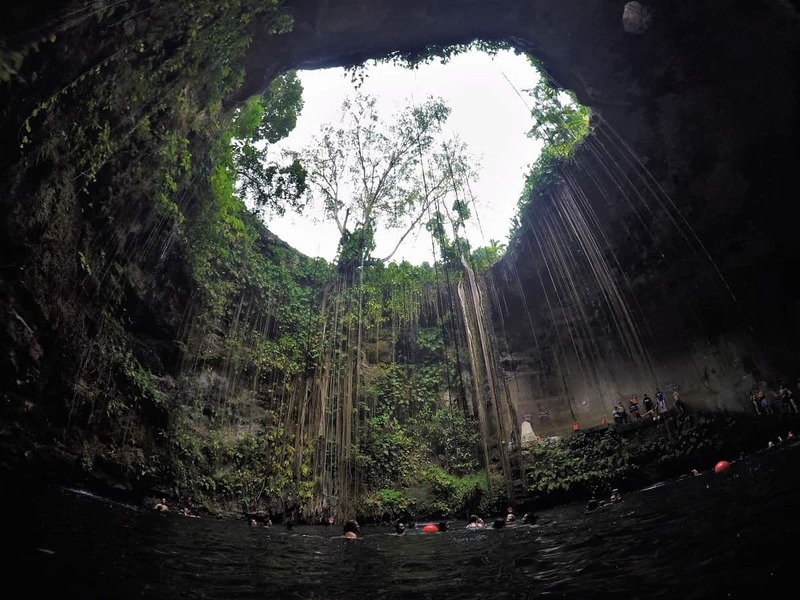 Ik Kil is a large cenote, but quite possibly one of the most popular and most visited cenotes on the peninsula. 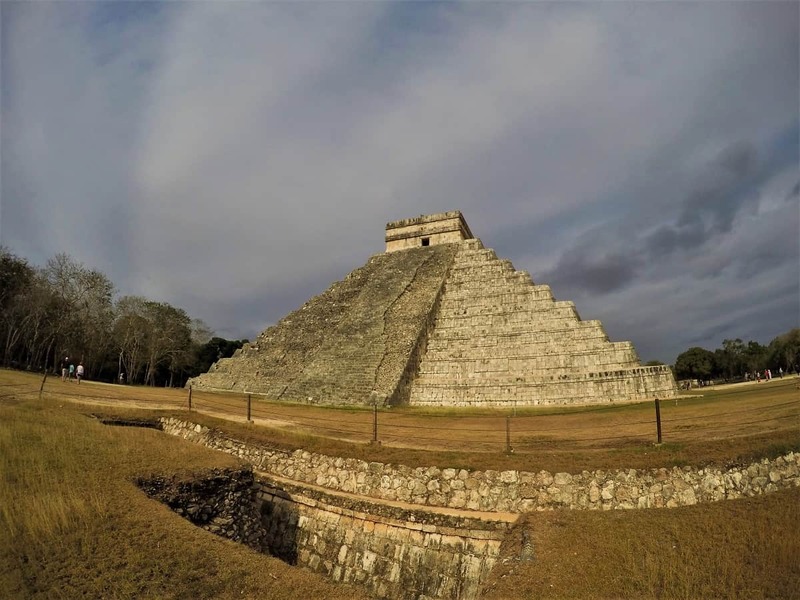 It’s located near the extremely popular Mayan ruin site of Chichen Itza, so tours usually combine visits to the two spots in their excursions. The place is like a compound, complete with restaurants, shops, and even accommodations on site. Our drive from Las Coloradas to Merida passed directly through the area, so we decided to make the stop. Unfortunately, we had got there at prime time in the early afternoon, so the place was packed. Putting the 100+ tourists out of mind, the cenote itself was actual quite impressive. This one was not so much a cavern like Fantasma, but more a giant hole in the ground with deep water at the base. The hole was about 100 feet or more in diameter, and dropped down into the earth over 150 feet. A tunnel and stairs had been carved into the ground that lead you down to the bottom of the massive pit, where you could swim or even cliff jump. From the water, you look up at the mouth of this giant hole in the earth and can’t help but be in awe. A ring of long, mossy vines dangle down from the top edges along with a handful small water spouts trickling down from the walls creating a surreal scene. Imagining this place with no one in it was hard to do, but something about seeing these places without 100+ tourists everywhere doing tourist things just makes the experience that much better. I’m sure if you arrived early in the morning you would have better luck avoiding the crowds, but either way, the majestic beauty of this cenote is worth the visit, crowds or no crowds. We visited our final cenote while on our way south down the west coast of the peninsula, after our stay at Celestùn. Again, I called upon our trusty iOverlander app to see what our options were along our route. The spot I ended up finding was another one deep off the beaten path. The first part of the drive to Kankirixche was down a tiny and seemingly endless paved road. We put our trust in our maps.me app, and eventually found the sign we were looking for. At first we thought we had arrived, but turned out it was another 20 minutes down a dirt road, barely wide enough for a golf cart, and through the dense woods that covers most of the Yucatan. When we finally pulled up, it was apparent that this cenote was way more underdeveloped than either of our other experiences. Sometimes that could be a bad thing, but in this case, it made us appreciate it a bit more. The parking lot was a simple dirt clearing that could fit maybe six vehicles. There was a small restaurant (if you could even call it that) along with some bathrooms and a shack occupied by the few Mexicanos that ran the place. The entrance to the cenote was right next to the parking lot. It was a small cave entrance with a staircase leading you down into the underground cavern. This one was only about 20 ft. underground, but opened to a pool about twice the size of cenote Fantasma. The entrance was the only source of light and when you swam into the dark cave and looked back, the beams that shined through created an awesome effect on the clear water. Unlike the other cenotes we visited, this one also had a series of fully submerged caverns, ideal for SCUBA diving. Its wild to think about it, but these fully submerged caverns can extend for miles. 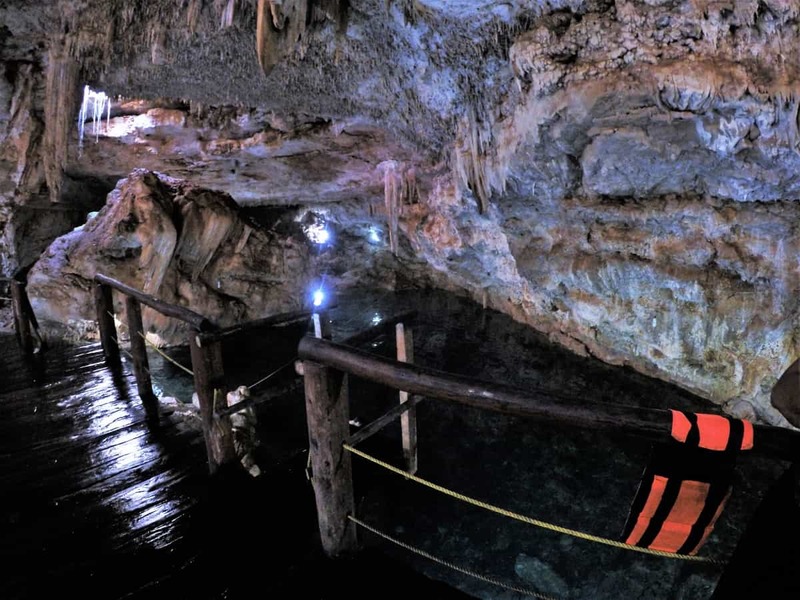 You could be almost anywhere on the peninsula and may never know when you’re standing on a deep underground cave fully submerged in freshwater, possibly even with a SCUBA diver or two swimming around under your feet. Some other stops we made worth mentioning were our trips to Mayan ruins. These ruins can be found all over the entire country of Mexico and throughout Central America. Some are more impressive than others, some more unique, and some with specific little highlights that make it worth experience. For us, we have quickly got burned out on seeing ruins. Unless there is a unique experience, it’s sort of like you see one, you see them all. But that’s us. I had stopped at my first one in Veracruz, which was cool because I was the only person exploring the site in the morning. We had also visited one in Belize, which was nice because we could climb to the top of the largest pyramid, and that isn’t always allowed. In Yucatan, we stopped at two. Chichen Itza must be the most commercialized and touristy Mayan site in all of Mexico and Central America. We had known that going in, but against our better judgement, we decided to still check it out. Mainly because the great Pyramid of Chichen Itza is listed on the 7 modern wonders of the world, and we were driving right by it. In an effort to avoid crowds as best we could, we decided that we would sleep in the area and go check it out when the gates first opened. Well, I guess that’s a common plan, because we got there 10 minutes before the gates officially opened, and there was already a line probably 100+ people deep. We were already committed, so we waited in line for the gates to open with the rest of the tourists. When we got to the ticket window, we were blown away by the cost of a ticket. Standard admissions to ruins throughout Mexico range from 50-150 pesos ($2.50-$7.50). Chichen Itza charges just under 500 pesos ($25) per person for access to the ruins, which is completely gouging and taking advantage. After some waiting, we got in and made our way to the great pyramid. While it was massive and impressive, it also seemed in too good of shape, as though it had been rebuilt, which made it feel a bit inauthentic. The back side of the pyramid was more beat up and what you would expect to see, which made it even more evident that the pyramid had been rebuilt and restored on the front side. I was actually more impressed with the El Gran Juego de Pelota court, which was massive. 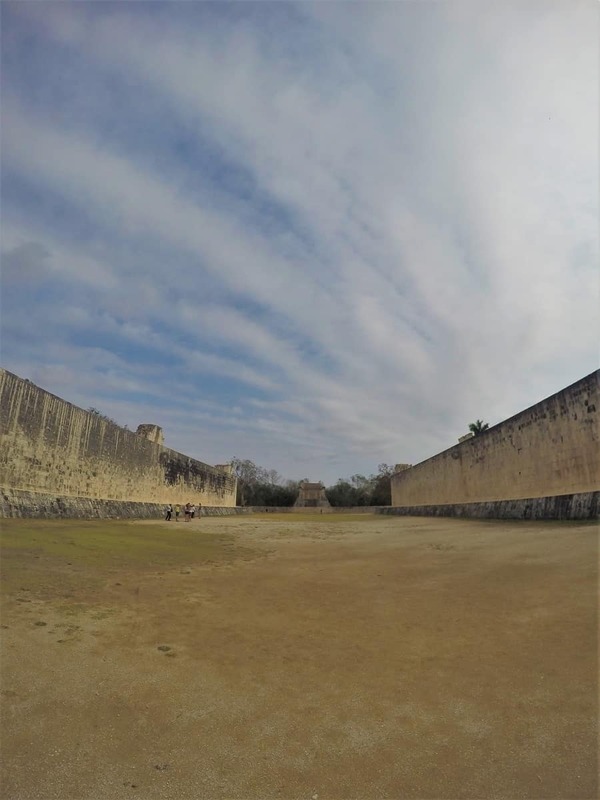 The game seemed to be very popular in Mayan culture, because you will find one of these courts at most sites, but usually a fraction of the size of this one. It was kind of like being inside the Roman Coliseum, just trying to imagine what it was like over 1000 years ago when the field was full of athletes competing and spectators filling the stands all around. We spent all of 20 minutes checking out the pyramid and the rest of the site and couldn’t help but laugh as we made our way out of the site only 30 minutes after it was opened. I guess the thrill of looking at old destroyed villages just isn’t our thing…no offense to those that like it, or that thought Chichen Itza was great. We ended up going to one more Mayan site, but this time with a purpose. 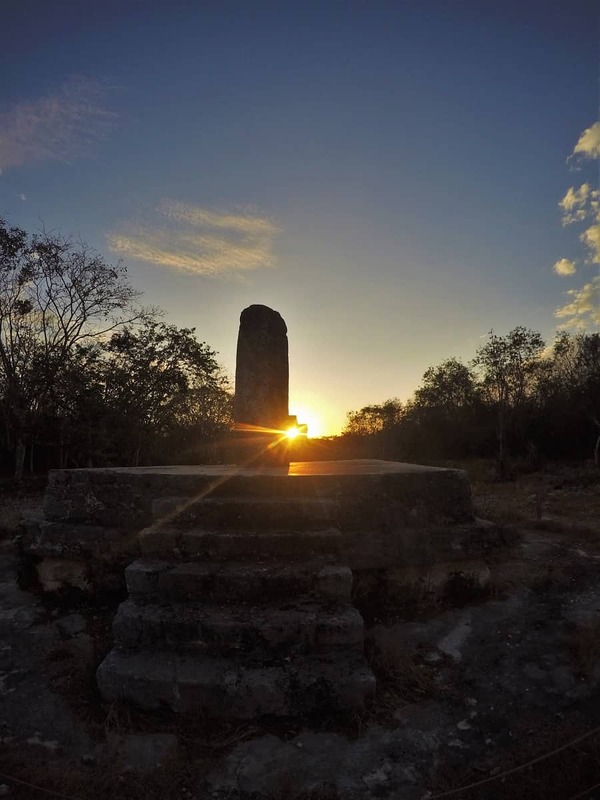 The Mayan site of Dzibilchaltun, north of Merida, has a temple famous for an event that occurs at sunrise, but only twice a year, on both the spring and fall equinoxes. From what we read, it’s best on the equinox itself, but can also be witnessed during the week leading up. We happen to be in the area only a few days before, so we decided to wake up before sunrise and try to check it out. When we got to the entrance of the site, we came to learn that they only open early for people to see the spectacle on the equinox itself. Luckily, an employee arrived for work as we were sitting at the locked gate. Using my broken Spanish, I explained to him that even though it was not the 21st, we wanted to go see the sunrise at the temple. It took a little convincing, but eventually he agreed to let us in. Only problem was, during the time it took to convince him to let us in, the sun began to rise. If we ended up walking to where we needed to go, we would have missed it. Our new buddy understood that, so he had us jump in his car, and he proceeded to drive through the Mayan ruins in his old beat up Toyota. The paths he was driving down were clearly not meant for vehicles, but he didn’t seem to care, he just wanted to make sure we didn’t miss the sunrise. This is the sort of warmth and hospitality we have seen throughout the country; such a kind people, it’s hard not to love Mexico. We got there just in time and it was amazing. The Mayans had built the temple on the east side of their village, along with a large pillar built ~500 yards to the west. At dawn on the equinox, you can stand at the pillar and watch the sun as it rises directly through the doorway, creating a bright fiery glow at the center of this temple and slowly illuminating the pillar. The top half of the temple is shaped like a pyramid with its top cut off, leaving a flat roof. As the sun continues to rise past the doorway, it first hides behind the structure before reappearing as though its rising out the top of the pyramid. It was a couple degrees off, being a few days before the equinox, but you could barely notice. The entire thing was unbelievably majestic and really helped you understand why the Mayans would put all this effort into planning out their village in this way. It’s mind boggling to imagine how this Mayan society had studied the sun and its movements overtime to eventually layout out and build these huge temples in the exact locations to allow this event to occur, and only twice a year. We felt much gratitude for having been able to be a part of this special moment; something left behind by an ancient civilization that is certainly not forgotten. It’s one of those special things about long term travel. Sometimes you just find yourself in the right place at the right time, but it seems it’s rarely by coincidence.